Cool and quiet. A Pentium processor, a 320 GB hard drive and a DOS operating system make for an inexpensive office notebook priced at around 330 Euros (~$441). 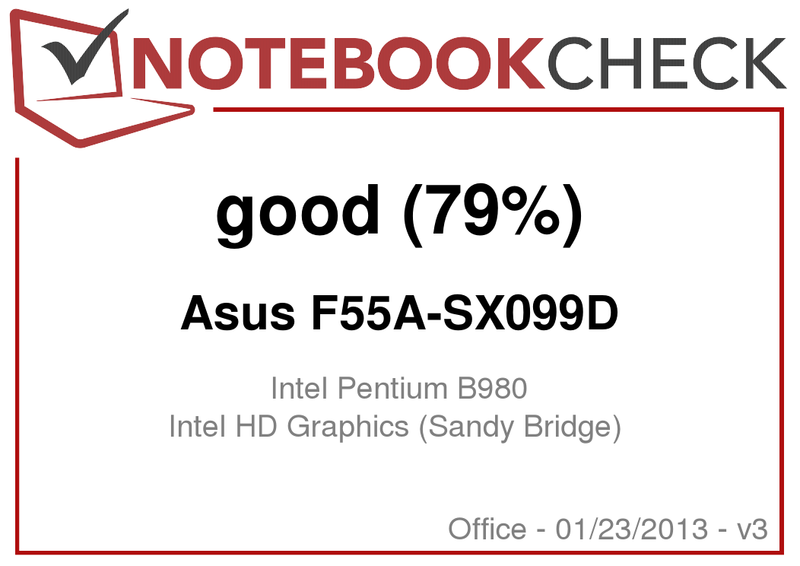 Our review shows whether Asus produced a good notebook at a low price or tried to pinch pennies in the wrong places. With their new line of inexpensive entry-level notebooks, Asus wants to motivate computer users to make a purchase. 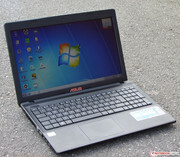 But innumerable devices from many different manufacturers are bustling about in the low-cost notebook arena. If you want to know whether Asus scored well with the F55A series or if they used their red pen where they shouldn't have, our review will tell you the answer. We will compare the notebook with the competing HP 650 (Pentium B970, HD Graphics) and Lenovo IdeaPad N586 (AMD A6-4400M, Radeon HD 7520G). 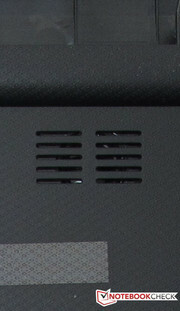 As one should expect from a computer in the F55A's price range, the whole case is made of plastic. Nice: all the surfaces are a matte black. The backside of the lid and the palm rest even have a surface texture that makes them easier to grip. 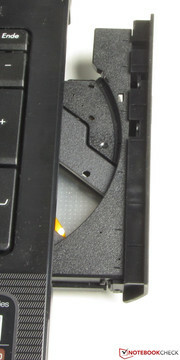 The HP 650 and IdeaPad cases are also entirely made of plastic. The F55A's base unit could be more stable. Around the area of the click pad the case gives quite easily. On both the left and right sides of the keyboard the case quickly yields to pressure. If you grip the base unit on the two front corners it gives a little too. The open lid doesn't withstand much pressure, though the backside of the lid resists stress well. The hinges hold the lid tightly in position and bounce a little. Opening the computer with one hand is still doable. Black is the dominant color. The texture makes the notebook easier to grip. The three devices' connectivity options are very similar. The only differences are found in the USB ports. The F55A only has two USB ports (IdeaPad: four, HP: three). In exchange, one of the two ports is a USB 3.0 port. The HP 650 has no USB 3.0 port. The ports on the F55A are poorly positioned - they are all towards the front of the left side of the case. 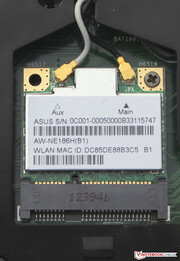 A WLAN module from Atheros (AR9485WB-EG) performs its service. It supports the WLAN standards 802.11 b/g/n. The WLAN reception works perfectly. The connection is stable both right next to the router (about 3 meters) and two floors below it (transmitting power: 50%). 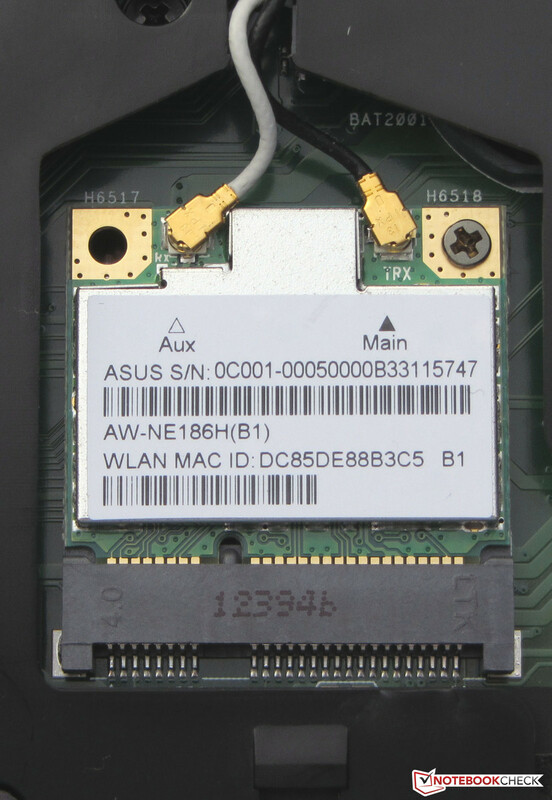 Asus chooses Atheros for their Gigabit Ethernet as well, installing a chip from the AR8161/8165 family. Those who purchase this notebook will have to do without Bluetooth, but there is a webcam. The webcam produces a somewhat muddy image with a resolution of 640x480 pixels. You'll find the usual in the notebook's packaging: a hardware handbook and a booklet with warranty information. Those who want to run Windows 8 on their F55A will find the 30-page Windows 8 user-handbook useful. 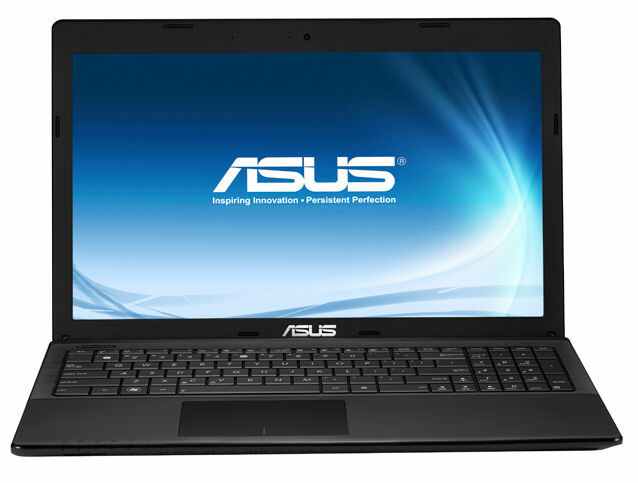 Asus also includes a driver DVD (Windows 7 64 bit). The F55A-SX099D is delivered with a preinstalled FreeDos operating system. 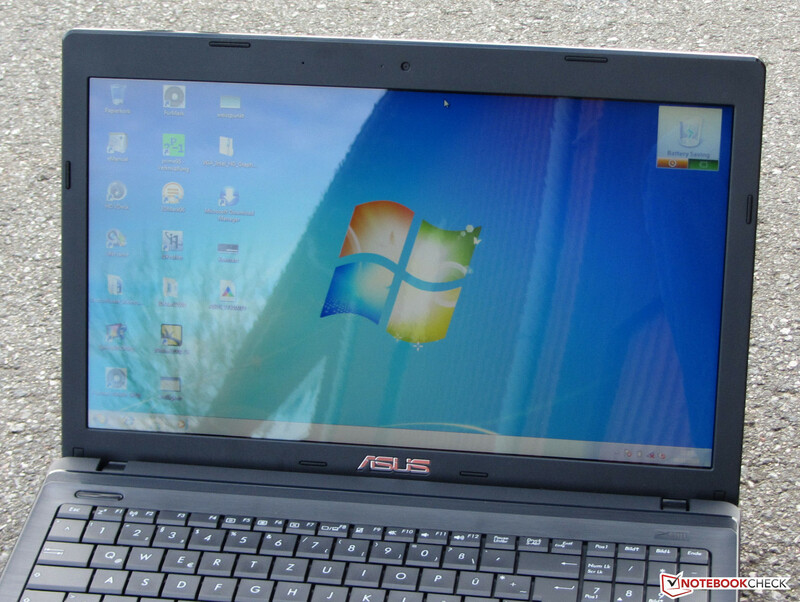 In order to run our tests we installed Windows 7 on the notebook. The installation process ran without a problem. The driver DVD proved to be very useful, seeing as Windows 7 doesn't include any drivers for the WLAN module or the Gigabit Ethernet connection. Those who don't want to spend money on an operating system can look to Linux. 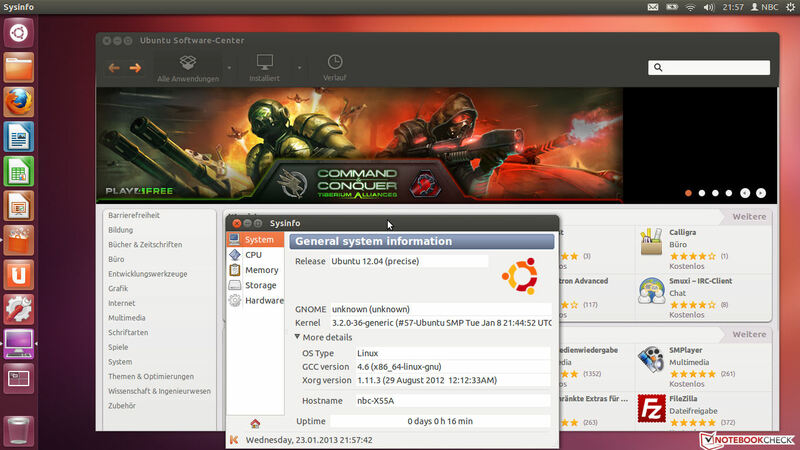 We tested an install of Ubuntu Linux 12.04 (64 bit). Immediately after the installation the WLAN module, the Gigabit Ethernet connection, the webcam and the memory card reader all worked. The volume keys worked after a system update. We couldn't get the brightness regulation keys to function. However, the brightness can be adjusted via a slide control in the Ubuntu menu. The F55A doesn't offer many maintenance possibilities. Behind the maintenance hatch you'll find the hard drive, the working memory and the WLAN module. The fan is not accessible. The notebook only has one memory bank. 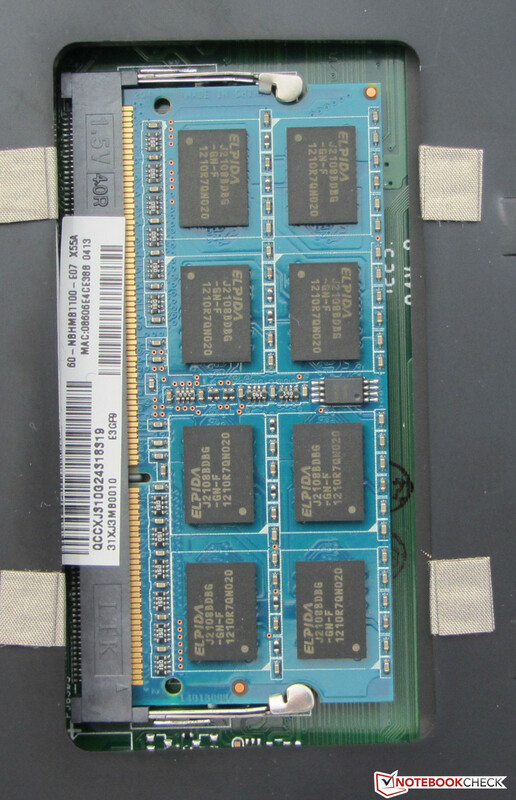 The memory is a 4 GB module and that's the bank's maximum capacity - the F55A only supports a maximum of 4 GB. The hard drive would be easy to switch out. Asus affords the F55A a 12-month warranty period. Both the HP 650 and the IdeaPad offer this same warranty coverage. 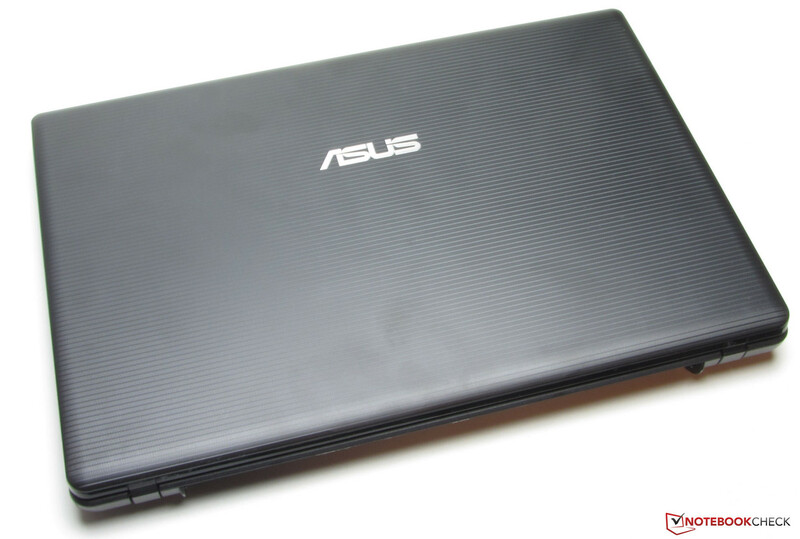 The Asus computer's warranty can be extended to two or three years. These warranty extensions cost about 50 and 90 Euros (~$66 and $120) respectively. An extension must be purchased and activated within the first 12 months. 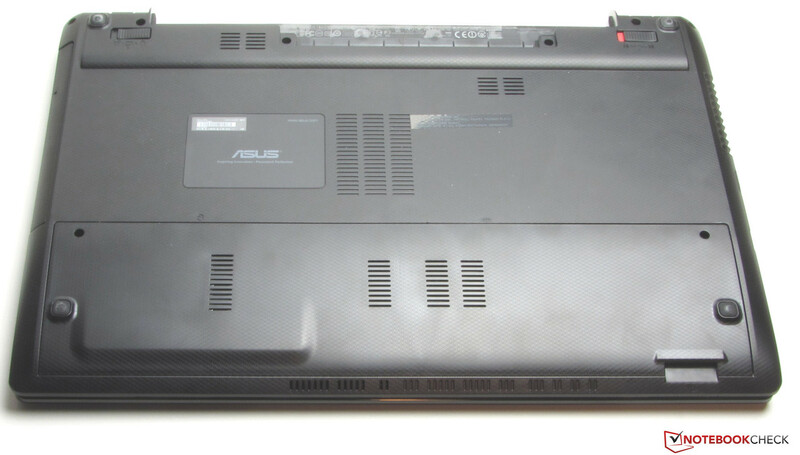 Asus provides the F55A with a conventional notebook keyboard. There is a number block. The main keys measure 17 x 17 mm. Due to the slightly curved undersides, the area for the fingers measures 17 x 14 mm. The individual keys have a mid-range stroke distance and a clear action point. The keys could be more decidedly resistant to the weight of resting fingers. Unfortunately the keyboard bounces quite a bit during typing; this is clearest in the middle of the keyboard. Those who write a lot would not be very content with this keyboard. 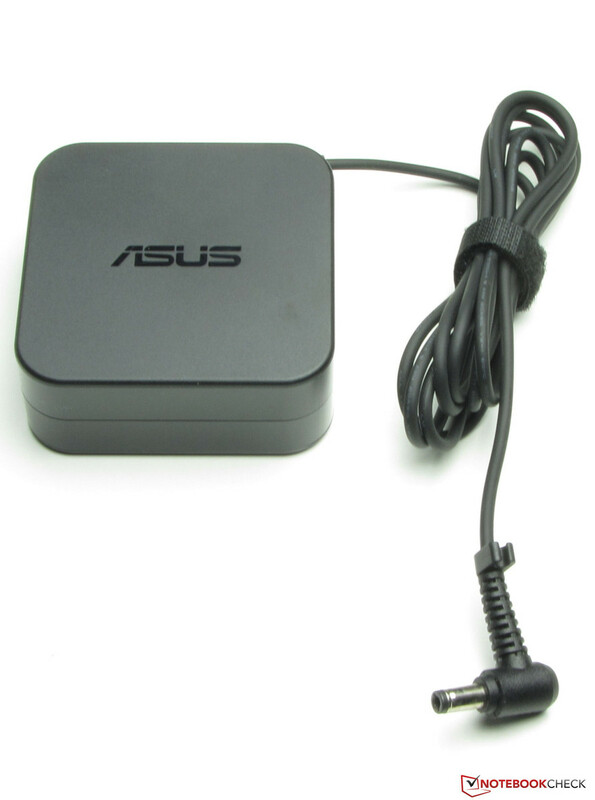 In lieu of a mouse Asus provides a 10.5 x 7.3 cm multi-touch capable clickpad. 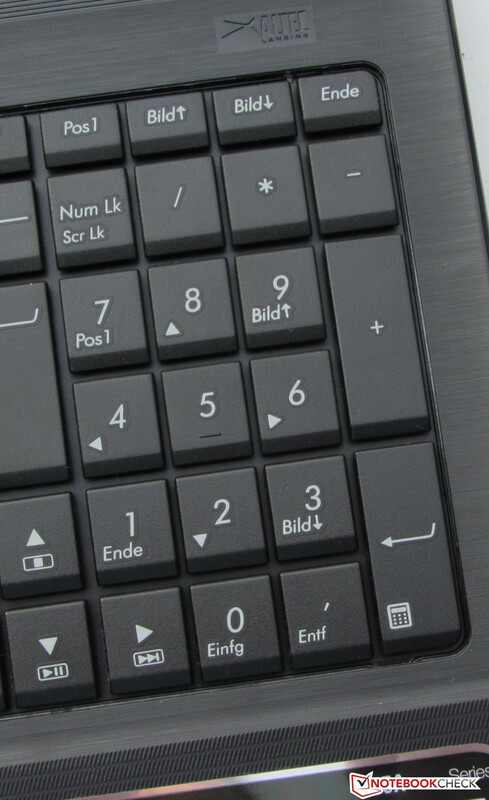 This is a touchpad without separate mouse keys: the whole pad is one key. Based on the position of the fingers in the lower area of the pad, the computer recognizes when the left and/or right mouse keys are clicked. The pad has a short stroke distance and an action point that is both clearly audible and easy to feel. 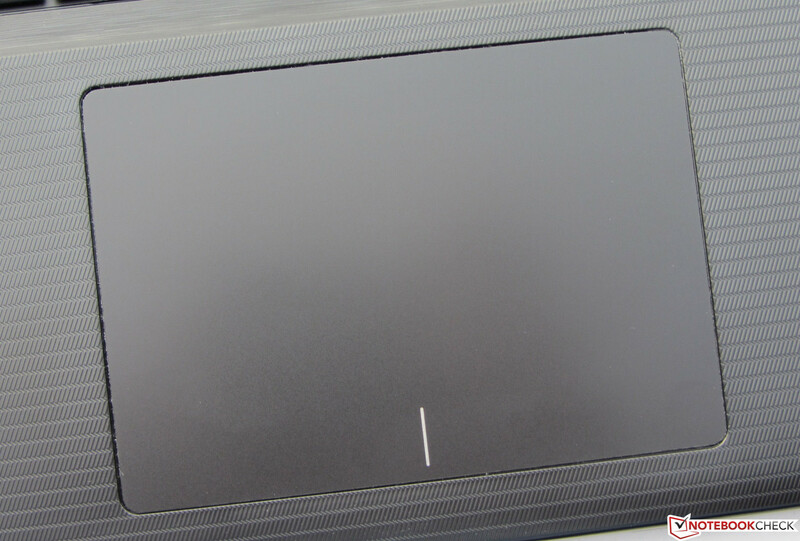 Due to the pad's size there is space to execute multi-touch gestures. Each individual gesture can be turned on and off in the configuration menu (under Windows). The smooth surface makes it easy for the fingers to glide across the pad. The keyboard see-saws tangibly during typing. Our test device's glossy display comes from Samsung and works with a native resolution of 1366x768 pixels. Other types of displays are not available. The display's average brightness lies at 239.8 cd/m² in a pretty good range. The IdeaPad's display (228.9 cd/m²) doesn't quite reach this value. 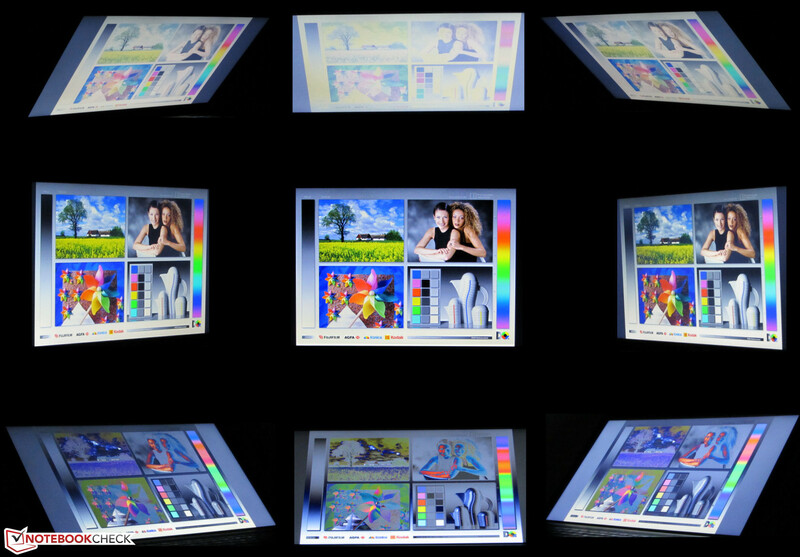 The HP 650's display (167.7 cd/m²) doesn't even begin to approach the brightness of its two competitors. The moderate results in the areas of contrast (241:1) and black value (1.08 cd/m²) aren't really surprising. These are in the common range for the notebook's price level. The IdeaPad (331:1, 0.72 cd/m²) delivers somewhat better values. 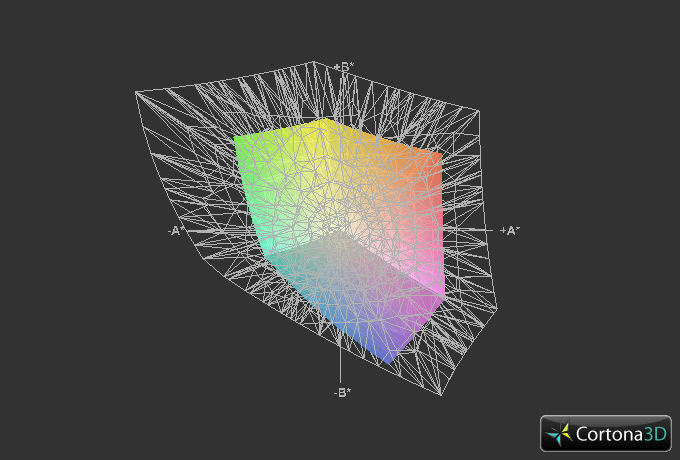 Once again the HP 650 (127:1, 1.32 cd/m²) can't keep up with the competition. 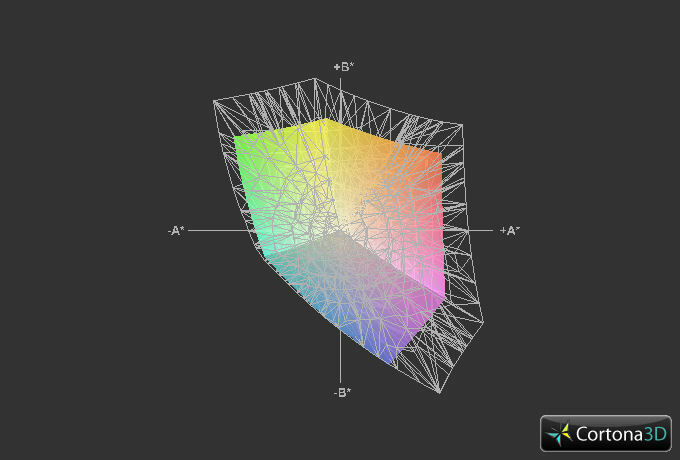 The display can't reproduce the AdobeRGB or sRGB color spaces. The brightness of the display is definitely strong enough for outdoor use. One should avoid environments that are too bright; otherwise the reflective surface of the display will prove to be bothersome. The stability of the angles of vision also reveals the price level of the notebook: if you change the vertical angle of vision on the display, the image quickly breaks down. The angles are more generous in the horizontal direction. 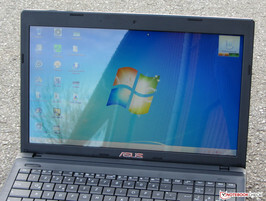 The Asus F55A in outdoor use. 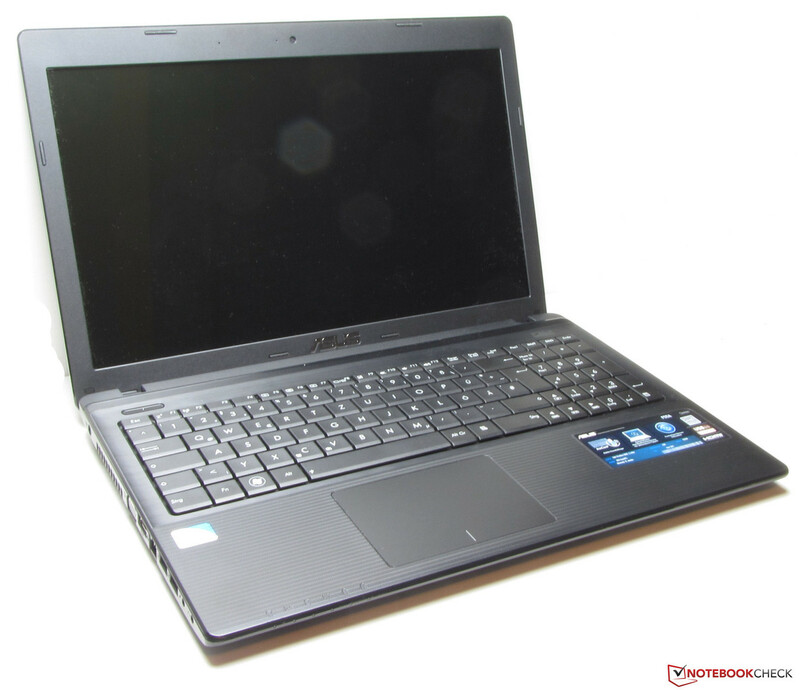 The Asus F55A belongs to the class of the low-cost office devices. Its performance is good enough for everyday tasks like surfing the internet, video calls, chats, office functions and playing DVDs or internet videos. Even videos in Full HD resolution (1920x1080 pixels) and H.264 coding aren't a problem for the notebook. The F55A series encompasses several models that differ in the areas of processors (only Pentium processors), hard drives and operating systems. In terms of price, the devices vary between 300 and 400 Euros (~$400 and $535) depending on their furnishings. Our test device is currently available for about 330 Euros (~$441). The "SX091D" model, outfitted with the same CPU and a larger hard drive (500 GB), is already available for as low as 299 Euros (~$400). The F55A is driven by an Intel Pentium B980 processor. The CPU has two cores at its command and belongs to the Sandy Bridge processor generation. 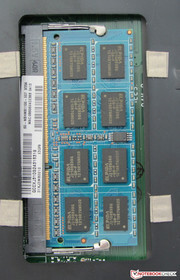 The processor works at a speed of 2.4 GHz. There is no turbo. The F55A performs the Cinebench tests at full speed. As a result, the outcomes are at the expected level. Thanks to a slightly higher operating speed, the F55A lies a little beyond the HP 650 (Pentium B970, HD Graphics). The IdeaPad (AMD A6-4400M, Radeon HD 7520G) can't keep up with the two competitors. The AMD CPU is no match for the Pentium. The story is exactly the other way around in the GL tests. The Intel GPUs in both the HP 650 and the F55A can't stand up to the Radeon GPU and are left in the dust. The system makes work comfortable and runs fluidly. The result in the PC Mark 7 benchmark lies in the expected range. 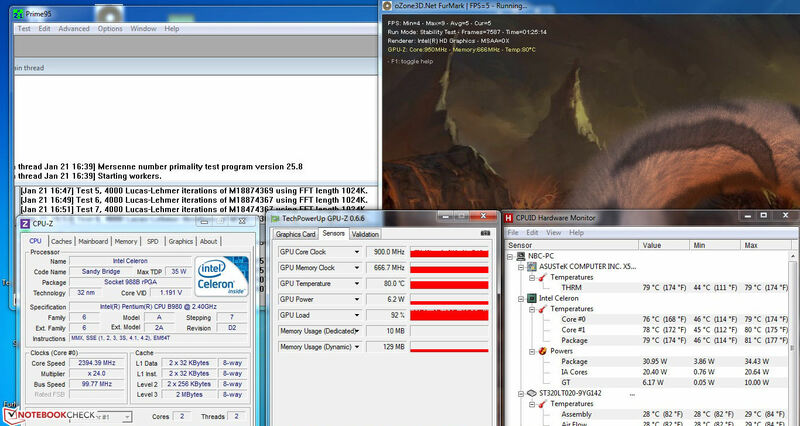 The HP 650 (Pentium B970, HD Graphics) and the IdeaPad N586 (AMD A6-4400M, Radeon HD 7520G) produced similar results. Asus treats the 15.6-incher to a hard drive from Seagate's Momentus Thin line. It has a capacity of 320 GB and works at a speed of 5400 revolutions per minute. CrystalDiskMark reports a read speed of 77.8 MB/s. HD Tune delivers an average transfer rate of 71.2 MB/s. These are average values for 5400 rpm hard drives. The F55A's GPU also comes from Intel and is termed HD Graphics (Sandy Bridge). Intel's current weakest performance graphics core supports DirectX 10.1 and works at speeds between 650 MHz and 1150 MHz. The results in various 3D Mark benchmarks lie at the expected level. The HP 650 (Pentium B970, HD Graphics) reports almost identical results. The reason: the same GPU is at work in both notebooks. In the comparison between all three devices the IdeaPad (AMD A6-4400M, Radeon HD 7520G) is the clear winner. The Radeon GPU reaches far beyond the performance of Intel's GPU - in the 3D Mark versions "06" and "Vantage" the Radeon GPU delivers twice as high a result. In addition it supports - unlike its Intel counterpart - DirectX 11. The Intel GPU used in the F55A was not conceptualized to display current 3D computer games. Such games can be played at the lowest resolution and quality settings at best. Games that have low GPU demands can be played in the native display resolution and at mid-quality settings - for instance the FIFA series. Anyone looking for a low-priced gaming notebook should take a look at the HP Pavilion g6-2200sg (about 479 Euros, ~$641). The combination of the Pentium B980 and the Radeon HD 7670M GPU provide for a fluid rendering of most games. In idle mode the F55A works quietly. We measure a noise generation of 30.6 dB. Here, the IdeaPad (31.5 to 32.2 dB) and the HP 650 (32.6 dB) can't quite compete. Under mid (running 3D Mark 06) and full load (Stress test, Prime95 and Furmark running), at 40.1 dB and 42.2 dB respectively, the Asus computer becomes distinctly louder. The IdeaPad (34.7 dB and 36.7 dB) works more quietly under load. The HP 650 (32.6 dB and 41.9 dB) only works more quietly under mid-load. The Asus F55A in the stress test. The notebook doesn't warm up much, no matter whether it's in idle or full load. In idle mode we measure temperatures between 28.6 and 31.5 °C (80.2 and 88.7 °F). Under full load the values increase moderately to 23.6 to 38 °C (74.5 to 100.4 °F). At these temperatures the device can comfortably rest on a lap in any load range. The HP-Notebook is on par with the F55A, the IdeaPad warms up more under full load than the competition. The CPU performs the stress test both plugged in and in battery mode at 2.4 GHz. The GPU starts the stress test plugged in at 1150 MHz. The speed then drops in the first 15 minutes in 50 MHz increments down to 900 MHz and remains there. In battery mode the GPU consistently runs at 650 MHz. Immediately following the stress test in power supply operation we ran 3D Mark 06 again, which came out with the same number of points as when we ran it from cold. The CPU temperature leveled off at around 79 °C (174 °F) in power supply operation. (-) The average temperature of the palmrest area of similar devices was 28.2 °C / 82.8 F (-6.4 °C / -11.5 F). 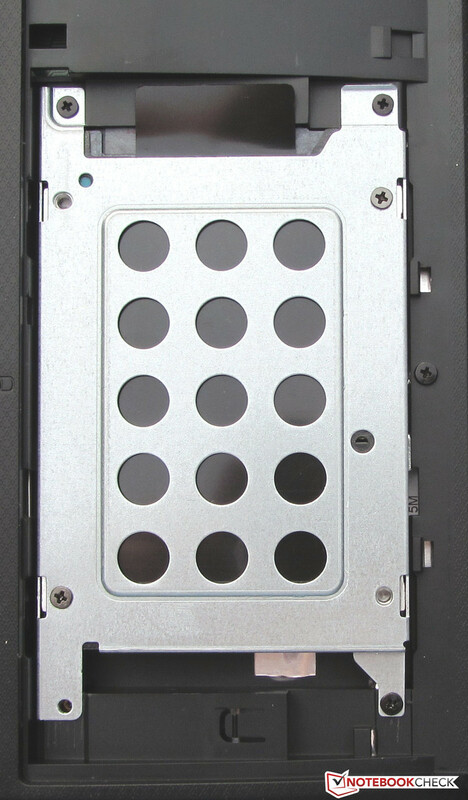 The stereo speakers are located on the underside of the notebook. The imprint "Altec Lansing" promises a good sound, and it delivers. The speakers produce a voluminous sound that you can easily listen to for a long time. Alternatively, headphones or speakers can be connected to the F55A. In idle mode and at maximum display brightness, the F55A permits itself a power consumption of up to 16.2 watts. The HP 650 (9.3 to 11.6 watts) and the IdeaPad (8.9 to 14 watts) prove to be more frugal. Under mid-load (3D Mark 2006 running) the F55A needs 40.6 watts -- again more than the HP 650 (31.6 watts). 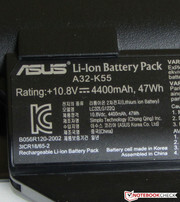 However, the IdeaPad (48.4 watts) consumes more power than both competitors. Under full load (Prime95 and Furmark running), the Asus computer (47.6 watts) and the HP notebook (47.5 watts) are on par with each other. Once again the IdeaPad (60.1 watts) needs more than either of its rivals. In idle mode the F55A reaches a run-time of 6:15 h. The HP 650 lasts a little longer at 6:32 h. The IdeaPad lies ahead of the competition at 7:10 h. The Battery Eater Reader's Test verifies the runtime in idle mode. 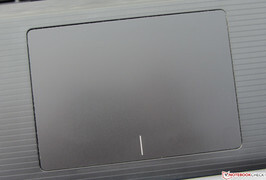 The display operates at minimum brightness, the energy-saving profile is activated and the wireless modules are turned off. Under load the battery dies out after 1:11 h. The competition (HP: 1:17 h, N586: 1:24 h) hold out a little longer. To verify the runtime under load we use the Battery Eater Classic Test on the notebook - here the display operates at maximum brightness, the high-performance profile and wireless modules are activated. The F55A finishes the WLAN test after 4:12 h. The IdeaPad (4:07 h) reaches a similar runtime. The HP 650 (4:44 h) greatly exceeds the competition. In this test websites are automatically loaded in 40 second intervals. The energy-saving profile is active and the display brightness is set to about 150 cd/m². A fully-loaded battery can manage to play a DVD for 3:47 h. At that value the F55A positions itself between the other two competing devices (HP 650: 4:01 h, IdeaPad: 3:29 h). The DVD test is performed with the energy-saving profile activated (or a higher profile, if the DVD doesn't play fluidly), at full screen brightness and with the wireless modules deactivated. 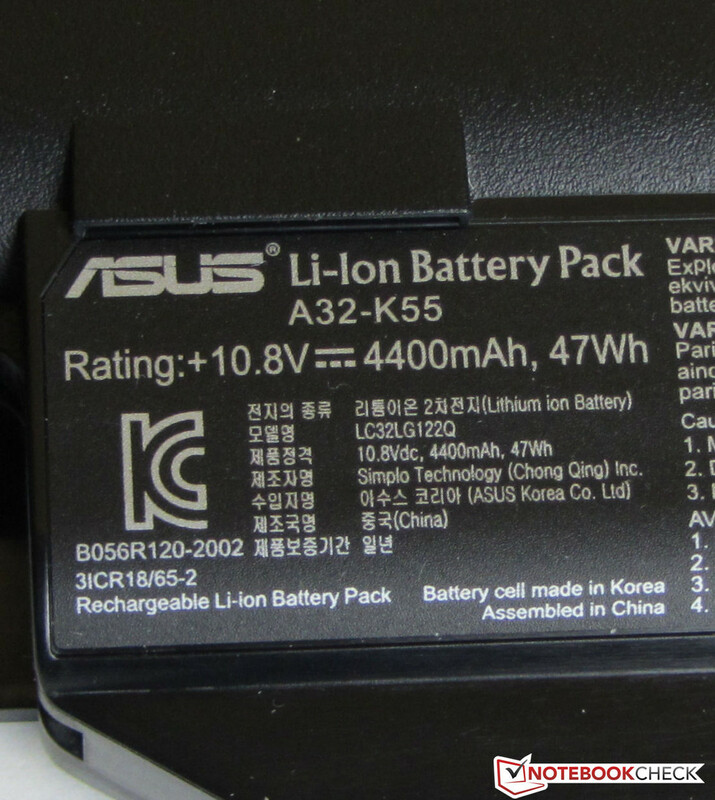 The three devices' runtimes are easy to compare, seeing as their batteries possess similar capacities (Lenovo: 48 Wh, HP and Asus: 47 Wh). The F55A's performance is more than good enough for the demands of most users. It usually works quietly and never gets hot. The battery run-times are satisfactory. But at a price of 300 to 400 Euros (~$400 to $535, depending on the model), cuts must be made. As a result, the notebook is equipped with a poor-contrast display and a rickety keyboard. Also, it only has one memory bank, and that only supports up to 4 GB. Additionally, the buyer has to make do with a DOS operating system. In our opinion, Asus marked a little too much with the red pen -- both of the competing devices have two memory banks and support more working memory. The HP 650 is interesting for any users who value a matte display. In addition, HP offers many warranty options for the notebook (ex. warranty extensions of up to 5 years). The IdeaPad N586 is a good choice for those who would like to play the occasional computer game. The built-in AMD APU can run current 3D games at low and sometimes even mid-quality settings. The N586 also offers a good keyboard. The power supply weighs 235 grams and provides an output of 65 watts. The hard drive could be switched out easily. There is only one memory bank. 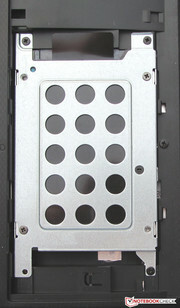 The speakers are located on the underside of the case. The DVD burner reads and writes to any kind of DVD or CD. Ubuntu Linux can be used on the F55A. The quiet operation noise and the low heat build-up. 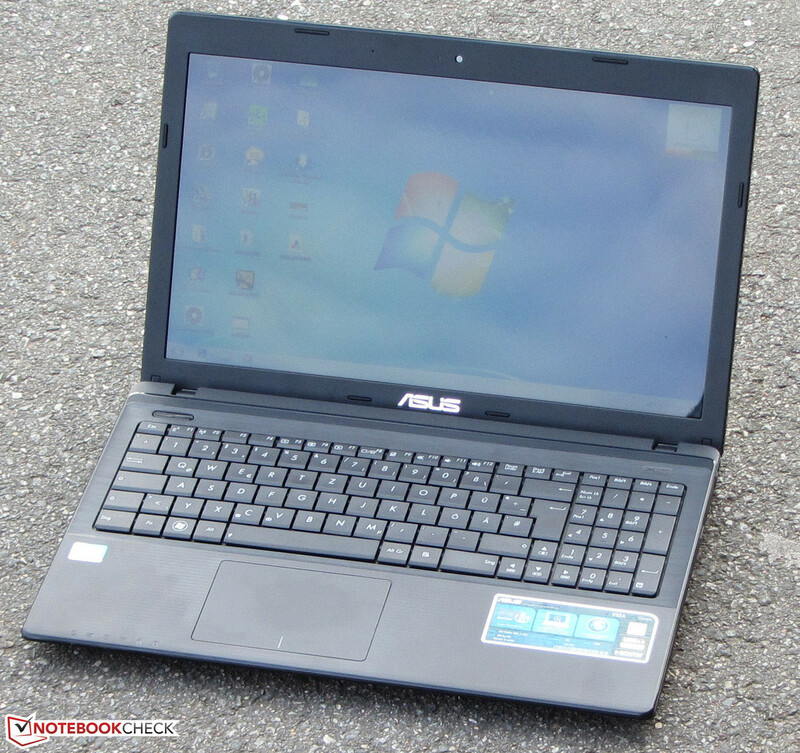 Asus surprises us with good speakers in a low-cost notebook. Lenovo IdeaPad N586, HP 650, Acer Aspire E1-531, Dell Vostro 2520, Acer Aspire V5-531, HP 655, Lenovo IdeaPad G580, Lenovo G585, Lenovo B570e, HP Compaq Presario CQ58-148SG, Samsung RV515-S03DE.